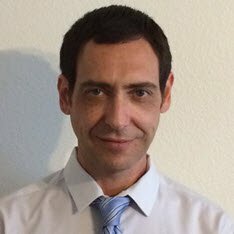 How to Profit from Pullbacks & Short-Term Price Swings - Trading Concepts, Inc.	How to Profit from Pullbacks & Short-Term Price Swings - Trading Concepts, Inc.
Let Me Show You How To Generate Consistent Profits From Low Risk Short Term Pullback Opportunities That Lead To Rapid & Powerful Price Gains... WITHOUT Complicated Formulas Or Guesswork! Learn From T​IME TESTED Swing Trading Strategies That EARN Consistent Profits With Low Risk Per Trade that Gives YOU a Major Advantage & Significantly Increase Your Profit Following Large Hedge Fund Momentum! Trading Pullbacks Can Give You An Unfair Advantage! Pullback trading offers high probability entry opportunities with lower risk per trade... helping you grow your account quickly! The profit for every dollar at risk over time tends to be higher when trading pullbacks in comparison to other trading tactics. Pullbacks or retracements are ideal for options traders because volatility levels decline during pullbacks... which lowers the premium you pay for the option. Institutional accumulation or buying pressure is the single biggest reason for explosive price gains... that can last days and weeks! These strategies can help you pinpoint stocks and ETFs that are being aggressively accumulated by the biggest hedge funds and institutional traders in the world. Eliminate all guesswork with clear and strategic entry and exit rules... they will help you target massive price gains without complicated math formulas or confusing charts. Winning Combination Of Low Risk & Big Profit Potential! 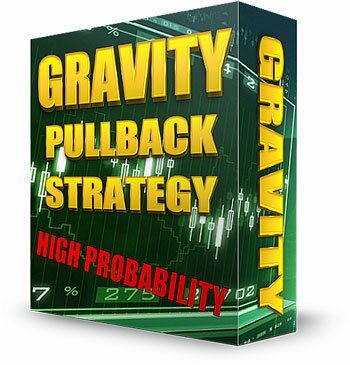 The Gravity Pullback Strategy is designed to increase profit and minimize your risk per trade. There's no complicated or confusing indicators to download or to figure out how to use. You'll learn complete rules for multiple profit target levels to help you increase the number of winning trades. The V-Bounce Volume Spike Strategy was extensively back-tested over the past 14 years on thousands of stocks and ETFs... and continues to thrive in real time market conditions! Target stocks, options and ETFs that are ready for bigger price gains. These strategies enter trades when the underlying asset is pausing or pulling back away from the trend... decreasing your risk of loss in comparison to massive profit potential. The average profit compared to the risk per trade is 3 to 1. And if you elect to use the second profit target or use options instead... the profit potential is even higher! Get both... the advantage of pullbacks which lower risk per trade and powerful momentum price moves without the large risk and volatility that comes with breakouts. You'll receive HD video tutorials that walk you through every part of the Strategies using several actual examples... step by step. No more delay due to lagging or outdated indicators that can cause you to miss your entry by several days or even longer. No confusing indicators to download or learn... so that you can begin trading the strategies right away! These strategies are flexible enough to work with all liquid financial markets, including Options... giving the trader with a smaller account opportunity to earn. These strategies target low risk pullbacks with high profit potential... so that your winners can quickly outpace your losers for maximum gains. The strategies are based on a simple technical pullback set up... that you will learn to identify quickly on any technical analysis chart. Everything is disclosed and there's nothing held back... you will know the logic behind every set up you trade with clear and detailed video instruction. We're here to help you every step of the way?... unlimited E-mail support to answer all questions and help you get started right away! Take Your Trading To A Whole New Level With Robust Trading Principles! Discover high probability trading filters that will increase your profit per trade and overall trade accuracy. You'll learn the essential principles of momentum... to help you anticipate when the trend is finally coming to an end. We tested every possible pullback trading level... find out which price retracement gives the highest probability of profit. Not all indicators work well with pullbacks... find out which ones are useless and which ones work best. Knowing the right price level to enter the trade can be tricky... learn proven tactics that will help you gain an edge and save you money. Strategy rules are completely disclosed and explained step by step... so you can begin using these strategies in real time market conditions right away! Dozens of visual chart examples are provides to help you gain confidence and get started the right way. You're not alone... email us anytime if you have questions and need answers. We reply to email within 24 hours and are only a few clicks away. We like to under-promise and over-deliver, and that’s exactly what we have done with these powerful swing trading strategies. In fact, we use these same strategies in our own trading on a daily basis. Alright, there you have it... if you have any questions, please either email me at [email protected] or give me a call on my cell at 248-320-1115. Start 2017 on the right track & learn from the best! LIMITED ONE-TIME Offer... ONLY $397! GET ACCESS NOW & SAVE $397... 50%! The Gravity Pullback & V-Bounce Trading Strategies are two of my favorite "go to" trading methods for low risk high probability trades. They use a proprietary filter for identifying institutional demand... so, what you end up with are winning strategies for trading Stocks, Options & ETF's that are ready to explode higher. I have been trading for over 30 years and your ratio of value to cost is 10 times better than any course on trading online or offline, period. 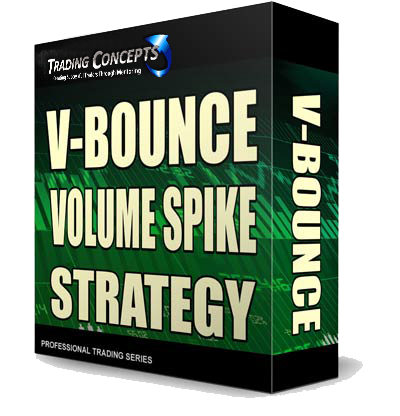 The V-bounce volume spike strategy is one of the best methods that I've traded in my 32 years of active trading and investing. It's simple, highly effective and targets the the lowest risk pullbacks with the highest profit potential. Good day, thanks for a pullback strategy that actually worked and I'm really glad I found one here! The tutorial is terrific, keep up the great work! I was skeptical at first, but the tutorial made perfect sense and gave me the confidence to trade the V-bounce in real time. I've taken a total 18 trades and not only are the winners substantially larger than the losing trades, the percentage of profitability is higher than expected. I've finally given up the search for the holy grail. Thank you! The Gravity is just what I needed to compliment my breakout method, it works and there's really nothing else to say except thank you. Thank you for sharing the V-bounce strategy with me. The rules are straight forward and simple to identify. Over the past 7 years, I've traded numerous active trading strategies and find V-bounce to be extremely effective for combining low risk pullback entry and high probability. I'm trading both options and stocks and the profits are consistent across most sectors! I was looking for a strategy that worked with stocks as well as options and I'm sure glad I found this one. Very impressive! My only regret is not buying the V-Bounce earlier. I had no idea that there was strategy to profit from institutional money shifting aggressively into stocks and ETFs. I compliment you for creating such a robust trading methodology, it's effective in different market conditions and works. Your knowledge for putting together actionable trading methods is truly amazing. It's been a while since I wrote a letter of gratitude to anyone online, but I have to let you know that your tutorials and courses are first rate! Happy to let you know that the V-Bounce trades are great. Your technique and knowledge is impressive. I started trading 6 different swing trading methods and now only look for set ups that fit the V-bounce. We're grateful to you for sharing sharing such effective trading tactics with the rest of us. I originally found your site on online and I'm very happy to say that you are the real deal. Your customer support is first rate and I appreciate you taking the time. After 40 years of trading stocks and options, I can tell B.S. right away and Roger's methods are the real deal! I've never made much sense of volume spikes and didn't understand how to follow institutional volume and more importantly take advantage of it. Can't imagine trading any other way... the advice is simple to understand and doesn't disappoint. The videos were easy to follow and the quality of the education is first rate. I'm a retired broker and you provide very high quality information that is well worth the cost. The V-Bounce is a good way to trade volume spikes. I'm able to find the set ups very quickly...just like you promised. I'm making money and feel comfortable trading for the first time in my life. Thanks for sharing such a high quality trading method. I got more than I expected. Thank you for such a great method of trading pullbacks. After 5 weeks I deleted my old indicators completely.